This is the latest article in The 74’s ongoing ‘Big Picture’ series, bringing American education into sharper focus through coverage of the latest data and research. Get new additions delivered straight to your inbox by signing up for The 74 Newsletter. To the research on private school choice, add one more layer: The Urban Institute has released the results of a study that shows that students participating in Florida’s tax credit scholarship program are more likely to enroll in college than their traditional-school peers, and somewhat more likely to earn a bachelor’s degree. 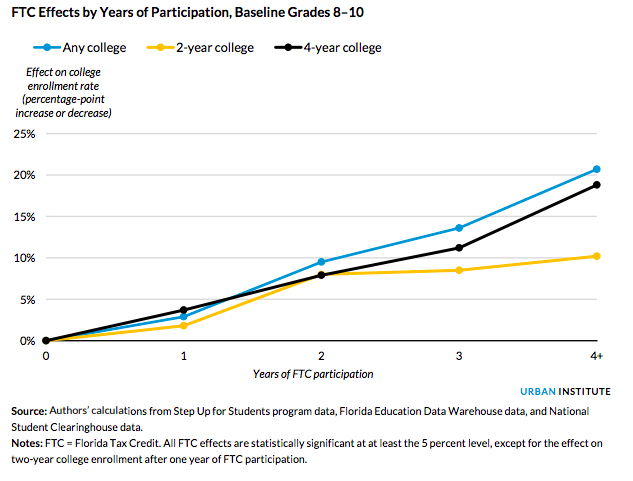 Compared with nonparticipants, scholarship recipients are more likely to enroll in a two- or four-year college. Students who entered the program in the elementary or middle grades were 6 percentage points more likely to enroll in college, according to the report, an increase of 12 percent. The effect was larger for high school entrants, who were 10 points more likely to enroll in college, an increase of 19 percent. 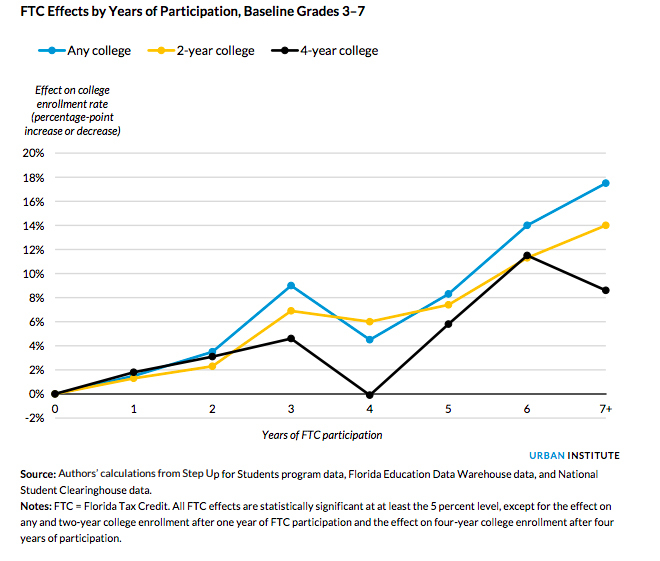 Participants are also more likely to graduate from college, though the effect is smaller. The number of graduates increases by 1 to 2 percentage points, for an increased likelihood of 10 to 20 percent, researchers found. 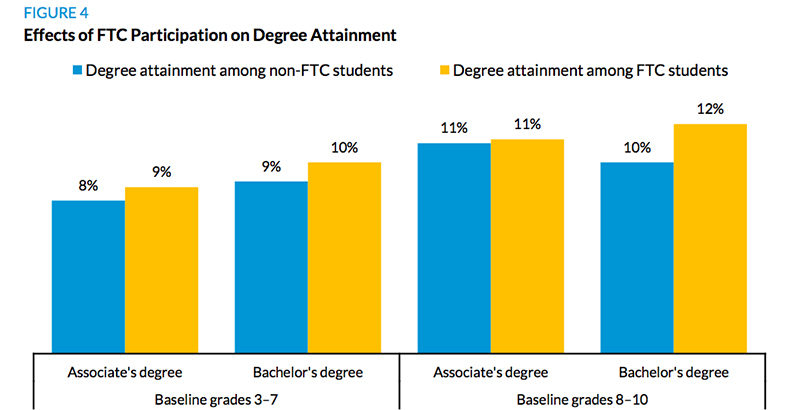 Students in the program for the longest time had the highest likelihood of earning a degree. Matt Chingos, one of the researchers who conducted the study, said it’s important to note that because of the number of students involved, a move of just a few percentage points that translates to an increase of 20 percent is “pretty significant.” No “great outcomes” were found among the similarly situated low-income students used for comparison, he noted. Still, “You can’t look at these results and say, ‘This process is achieving magical results,’” he added, nor is this type of large-scale study very useful for determining why a program might achieve a particular result. 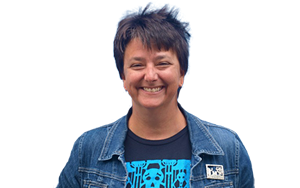 Chingos directs the Urban Institute’s Center on Education Data and Policy. The research was funded by the Bill and Susan Oberndorf Foundation, the Walton Family Foundation, the Robertson Foundation, Kate and Bill Duhamel, the Foundation for Excellence in Education, and the Charles and Helen Schwab Foundation. The latest in a series of studies examining publicly funded private school choice programs and college enrollment and graduation, the report examines outcomes among the more than 100,000 low-income students receiving the Florida Tax Credit scholarship, the largest program of its kind in the country. Sometimes described as a form of voucher, tax credit scholarships are funded by companies that donate a portion of their expected state taxes to Step Up for Students, a nonprofit that administers the awards. Funds can be used for private school tuition or to pay for transportation to a school outside a student’s home district. Participants have an average household income of less than $26,000 a year, and 68 percent are black or Hispanic. Florida has three other private school choice programs that serve specific populations. Like the other two programs studied, the Milwaukee Parental Choice Program and Washington, D.C.’s Opportunity Scholarship Program, the Florida scholarships, which were created in 2001, have been in existence long enough to allow researchers to begin examining how many participants enroll in college and graduate. Unlike test scores, which are an immediate but incomplete measure of results, college enrollment and graduation shed light on a program or policy’s long-term outcomes, Chingos said. Research looking at test scores among participants in private school choice programs has been mixed. The same researchers released a first look at college-going among Florida scholarship students in 2017 using only records from public two- and four-year institutions in the state. That report looked at 10,000 students who received scholarships between 2004 and 2010 and found that enrollment in higher education increased by 6 percent. Almost all of the increase in the 2017 report was in community colleges. Researchers characterized the impact on degree attainment as slight. 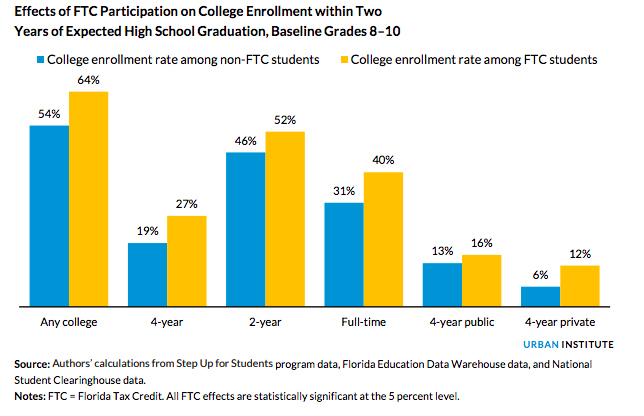 The new study uses data from the National Student Clearinghouse to track enrollment in both in-state and out-of-state public and private colleges. It compares the experience of those students with students of similar academic and demographic profiles who remained in public schools. The 2017 report compared participants with students who stayed in the participants’ former schools. Previous studies in the series found that voucher recipients in Milwaukee were more likely to attend college but not more likely to graduate, while recipients in Washington, D.C., were no more likely to enroll in higher education. The Milwaukee program is the nation’s oldest, and Washington’s is the only federally funded effort. 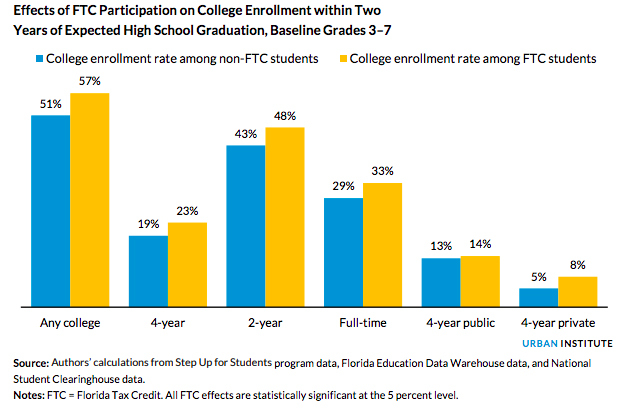 The new research found that 57 percent of Florida tax credit scholarship recipients enrolled in college, an increase of 12 percent, compared with 51 percent of non-participants. Enrollment and degree-attainment rates go up the longer a student uses the scholarships, but the results suggest the number of years spent at a private high school has a larger effect on a student getting a bachelor’s degree than the years a student spent enrolled at a private elementary or middle school. Of students who began using a scholarship in grades 8 to 10, 12 percent earned a bachelor’s degree, compared with 10 percent of non-participants. Ten percent of students who first got a scholarship in grades 3 to 7 earned a bachelor’s, compared with 9 percent of non-participants. Research on the effectiveness of vouchers and other forms of private school choice nearly always sparks lively debate about interpretation, cleaving along ideological lines. By way of example, Chingos noted, people who like a study’s findings are likely to point to the fact that college-going rates increase the longer a student has had a scholarship. Those who disagree will predict that any positive impact will dissipate as more and theoretically lower-quality private schools enroll. Go Deeper: This is the latest article in The 74’s ongoing ‘Big Picture’ series, bringing American education into sharper focus through coverage of the latest data and research. Get new additions delivered straight to your inbox by signing up for The 74 Newsletter. Disclosure: The Walton Family Foundation was a partial funder of the Urban Institute’s Florida tax credit scholarship program evaluation and funds The 74.